Test mules for the Bentley Bentayga SUV are continuing to shed their camouflage ahead of its reveal later this year, with the car likely to make its public debut at September’s Frankfurt motor show. The latest spy pictures, taken during hot weather testing in Death Valley, show the car with a less disguised front. The round headlights are still camouflaged but the rest of the front is totally undisguised. These pictures are the first time that all air intakes in the front bumper are on show. 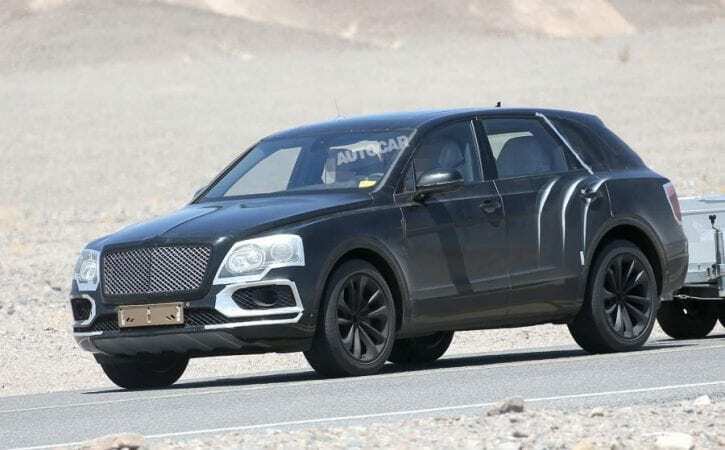 The spy pictures reveal that the production Bentayga will bear little resemblance to the EXP 9 F concept, after that car divided opinion at its 2012 Geneva motor show debut. The Bentayga is due to go on sale early next year and is claimed to combine “pinnacle luxury and performance”. The new “ultra-luxury” SUV is now in its final test phase, Bentley chairman and CEO Wolfgang Dürheimer recently told Autocar, and the model will come in W12, V8 and plug-in hybrid guises. He revealed that the hybrid would be capable of covering 30 miles on battery power alone, to cope with future zero-emissions legislation in cities. “This will be a very luxurious model,” he said, “but it will also be very fast and very capable.” Hybrid versions of the Bentayga are expected to follow around a year after the launch of conventional models. Bentley has previously revealed the luxurious cabin of the upcoming Bentayga SUV in a video. The video revealed that the Bentayga will come with a touch-sensitive driving mode selector, which also incorporates the engine’s starter button. The driver’s display has also been shown, revealing that – in this early depiction at least – the Bentayga’s speedometer ends at 320km/h (200mph). That could prove relevant, as from the early stages Bentley bosses were said to have set an ambitous 200mph top speed target for the SUV. An advanced night-view assistance package is also showcased as part of the video, as well as a multi-function instrument cluster display that appears to be configurable by the driver. The Bentayga’s unusual name comes from the Roque Bentayga, a dramatically rugged mountain landscape on Gran Canaria in the Atlantic. Initial speculation suggested the model might take the ‘Falcon’ name. The Bentayga was previewed by the EXP 9 F concept car at the 2012 Geneva motor show, although rumours of the SUV project go as far back as 2011. Confirmation that Bentley would build the model came in July last year as part of an £800 million investment in the firm’s Crewe headquarters. The final design, which has been aerodynamically optimised to ensure stability at high speeds, is said to have an overall width of around two metres. Last summer, Bentley design chief Luc Donckerwolke revealed that the production car’s shape had been signed off, saying: “The concept is completely set apart and was done separately. After Geneva 2012, I was told to do a new one. It’s completely different from the concept car. “The concept was only intended to pose the question, ‘Can we do a Bentley SUV?’, rather than showing a production car. I started with new parameters and a clean sheet [of paper].” Indeed, Donckerwolke has never seen the EXP 9 F concept in person. From the outset, Bentley officials are understood to have targeted the car towards emerging but profitable markets such as China and Russia. Reviewing results of the company’s fifth straight record year, which show a 9% increase in sales to 11,020 cars, 87% of which were exported, Dürheimer also hinted at a smaller Bentley SUV model in the future. He said he had great enthusiasm for the SUV market, which was “expanding three times faster than the market as a whole”. Previous predictions of annual sales of 3000 for the full-size SUV “could be conservative”, said Dürheimer, who is working towards building 20,000 cars a year at Crewe by 2020. The company says it already has 4000 serious “expressions of interest” in the big SUV, which is yet to be seen by customers. The starting price of the Bentayga is likely to be around £130,000. Initially, it was understood that Bentley would look to build the SUV in Bratislava, Slovakia, if production at Crewe could not be confirmed. To reach its aggressive production targets, Bentley will spend £280m this year on building a new R&D centre, across the road from its traditional Pyms Lane site, and plans to add 300 new jobs to its workforce, making 1300 in all. By 2016, total expenditure to ensure that capacity at Crewe “is no longer an issue” will amount to £840 million, Dürheimer said.